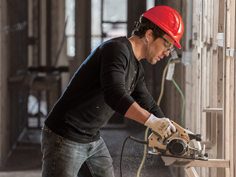 With many facilities running around the clock, it’s important that your workers have access to the tools and equipment that they need to get the job done – and perform it safely. Industrial vending machines have answered the call as a solution to not only manage the inventory of these critical items, but also to ensure they are consistently accessible for workers. But these are only the tip of the iceberg when it comes to the benefits of a vending solution. Vending plays a key role in managing the employee usage of products as each employee’s usage can be tracked down to each product dispense. This accountability typically translates into a reduced consumption of up to 30% on the items held within the vending machines. Vending machines can also be set up with usage restrictions on certain products whereby they can only be dispensed to those workers who require them. This prevents workers from obtaining that ‘cool’ or expensive product that they don’t need for their jobs. Locker style machines can also be set up to for item ‘rentals’ with take and return capabilities. Set up and manage auto alerts if the products are overdue for return which reduces the chances of losing or misplacing expensive items. Vending machines have one massive advantage over your typical store room. 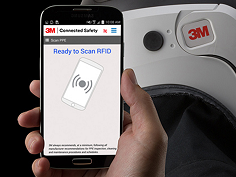 They can be placed virtually anywhere. Placing vending machines close to your workers decreases walk time to and from the store rooms. Saving a couple minutes in walk time each trip, every day of the year does add up to more on the job time which leads to more productivity and a more efficient workplace. Vending machines allow for automatic alerts for when stock levels deplete and require replenishment. This means the system itself can automatically order more stock for the machines and have it arrive before the machine stock out. Automated reporting on product usage can also give you further insight into the usage of each business unit or job number giving you greater insight on when product usage will spike allowing you to plan other expenses accordingly. 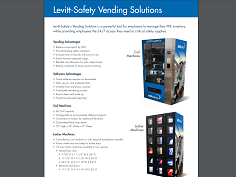 See the benefits for yourself by requesting a presentation and cost analysis of a vending program for your facility.